Opening Sentences: Lola’s daddy takes her to the library on Saturdays. The library is very busy, but Lola finds some excellent books. Synopsis: Every Saturday, Lola and her daddy bring a pile of picture books home from the library. Each night either daddy or mommy reads one of the stories to Lola and the next day she acts out whatever happened in the story the night before. She becomes a fairy princess, a pilot (with a wooden spoon and a spatula stuck in the bottom of a cardboard box for her controls), she tries her hand at farming and building, she delights in her sparkly magic shoes even through the next night’s story about a monster (the illustration is an obvious homage to Max in Where the Wild Things Are). Activities/Resources: The first and most obvious activity to accompany this book is a trip to the library. That could be extended by trying to find books like those Lola and her parents read – The Very Fairy Princess, Old MacDonald Had a Farm, and Where the Wild Things Are, come readily to mind. The next logical step is to encourage free imaginative play growing out of these reading experiences. There is an activity guide for this book and its companion, Lola Loves the Library, at the publisher’s website (links are just below the double page spread sample illustration). The What to Expect website for expectant parents gives tips on introducing small children to the library. The website Play Activities has a list of 9 Ways to Encourage Imaginative Play. PBS Parents has suggestions about encouraging imaginative play as well. Availability: Readily available in paperback. Very creative Beth! My favorite is Night Monkey, Day Monkey so I’d have to climb a tree lol. Climbing trees can give you a whole new perspective on the world! You know, I was actually in the act of writing this book (or something very similar!) so I’m really glad you posted it – now I know it’s been done! 🙂 This book looks delightful – thanks so much for adding it to the list – such a great topic! I’m sure you can put your own unique spin on such a story. Phyllis goes to the library, perhaps? What you shared about this books really emits a spotlight on the joys of reading and the use of imagination, both of which are very important and make for lots of fun. Thanks for sharing. Sounds like a wonderful book. Thanks, Angela. In a week in which I was highlighting the imagination, this book seemed perfect! What a wonderful book. Going to the library, especially in the summer, is one of my great childhood memories. And now I take the boys at least once a week (I am constantly picking up books for research). Because of PBFF we always have a deluge of books! How about making that PPBF. Not sure what PBFF stands for: Picture Books Fully Fantastic? Picture Books Fully Fantastic works for me! A deluge of books is the best deluge there can be. This sounds very sweet. My youngest son does this with books, movies, TV shows, video games. It all sparks wonderful creative play. This morning we were on the starship Voyager, battling enemies and discovering new planets. Thanks, Beth! I am so delighted to hear of your son’s adventures into imaginationland — sounds like a great kid! Anything to encourage trips to the library is great! Fantastic! I’m actually going to the library today, so I’m going to see if I can find this book. Oh , I hope you found it! I also always love to see more African American families and children portrayed in picture books as they are still so underrepresented. Love this choice Beth! You’re right, Joanna. It’s good to see people of all different heritages in picture books. Thanks! This book looks great, and love the encouragement to spend more time reading with our families. Great choice, Beth! Thanks, Amy. There’s nothing quite like reading together. This just makes me look forward even more to when I have a little 7year old running around our place for a week in August. Love to see what books he likes and his imagination working overtime….Can’t wait! The library will be one trip on the list of to do’s…. Oh, that’s going to liven up your household, Diane! Enjoy the visit to the full. Glad the library’s on your list. I love the cover art! A book about reading and libraries sounds like a book for me! 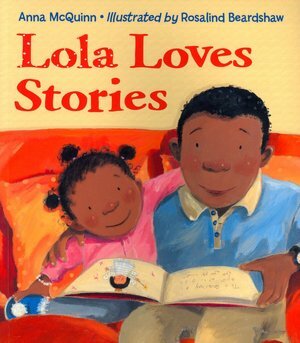 There’s another book that’s about the same character and subject, Lola Loves the Library — I bet you’d love them both! What a sweet story! I’m going to pass this along to my expecting daughter-in-law! What a wonderful sounding book. I like the name Lulu or Lola. Thank you, Beth, for sharing this great story…and the resource and activtiy is wonderful! What a creative choice Beth. I really like your suggestions. And I am pleased it features an African American family.